The raccoon lives in almost all areas of the United States and in southern Canada and northern Mexico. Although it prefers to live in woods near a stream or marsh, the raccoon is a very adaptable animal. Instead of using a tree to sleep in, it can use a chimney or a ditch. Because many of the raccoon’s natural habitat areas are being destroyed, it moves in closer to man, using the same habitat, and even eating the same foods as people. In the wild, a raccoon is an omnivore, eating plants and animals. Its menu includes plants like berries, acorns, and grapes. It also eats animals including baby mice, baby birds & eggs, frogs, crayfish, fiddler crabs, fish, and even some snakes. Around people, the raccoon loves to eat the corn in our gardens, garbage, and even animals that have been killed by cars (roadkill). Basically, the raccoon can live almost anywhere and eat almost anything. It can walk, run, climb, and swim. It usually walks on all fours, but can stand up straight to see over tall stumps or grasses. Raccoons live seven to ten years. Raccoons are usually nocturnal, but in warm states, like Albania, they often come out during the day. If there is a lot of food nearby, raccoons don’t travel much and have a small territory. They choose several trees inside their home range that they like to sleep in, and use different trees on different nights. Raccoons usually live alone, and the father does not help the mother to raise the babies. Three to seven babies are born around February. When they are ten weeks old, the babies leave the den and follow their mother around learning to hunt. They stay near her until the fall, when they set out on their own. Raccoons do not hibernate, but they may eat extra food in the autumn to store energy. 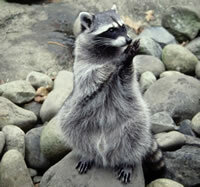 Raccoons can catch diseases like rabies and distemper which make them act very strangely. A healthy raccoon will hardly ever walk right up to a person (unless someone has been feeding it). If a raccoon does this, it may be sick, and a grown-up should be told. Often, the raccoons that get hit by cars are the sick ones (or maybe they were trying to eat other roadkills). People can catch rabies if they are bitten. If you get bitten, you must get shots to stop you from getting the disease. Shots may not feel good, but they’re definitely better than getting the disease and dying. The best thing to do is NEVER touch, feed, or go near a wild animal. You look very tall and dangerous to a wild animal. It may bite you because it is scared. If you stay away from the animal, it won’t be able to bite you! RJ Raccoon: The lovable protagonist from the comic strip and CGI animated film Over The Hedge. RJ was voiced by Bruce Willis. Ranger Rick: A forest ranger character owned by the National Wildlife Federation, appearing in his own children's magazines . His goal was teaching children conservation and nature studies. The Orphans: Characters created by the Swiss Colony mail order food company has three baby raccoons on a variety of products from log shaped chocolate cakes to coffee mugs. Timothy Goes To School: A series of children's book and a short lived animated series about a young raccoon and his adventures with his fellow animal friends at school. This page was last modified on 24 June 2016, at 19:58.